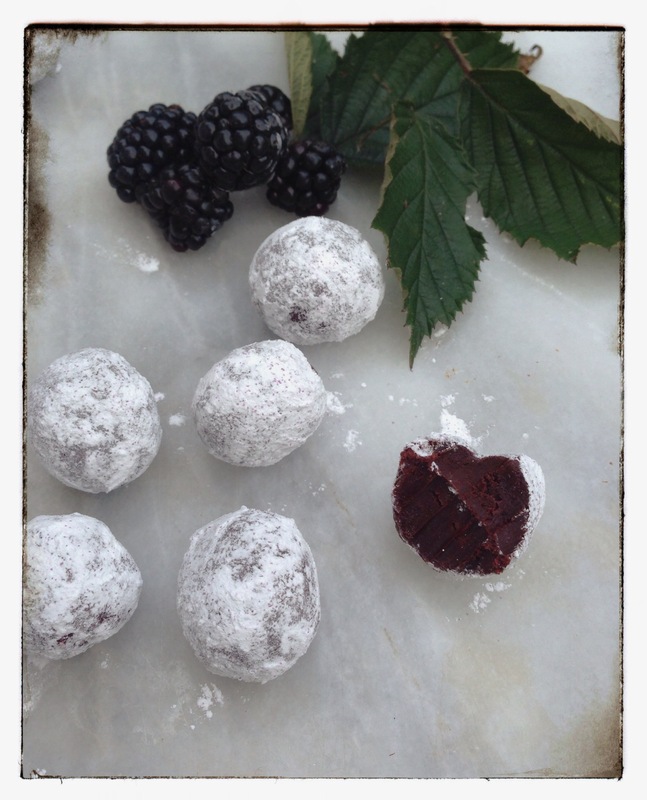 Suddenly there are blackberries aplenty in the hedgerows – but you have to be quick before they’re snaffled by eager jam makers, or sadly wither on the bramble. 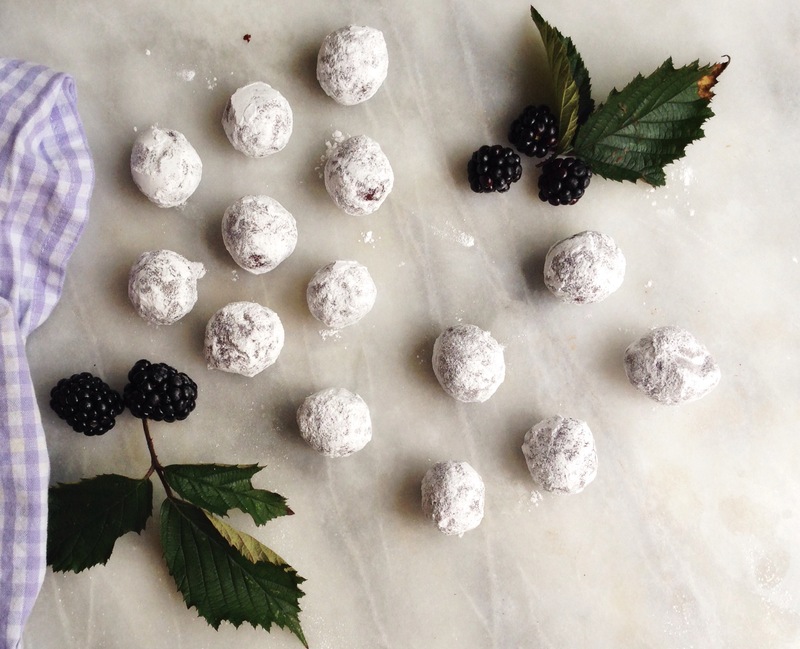 A thousand miles better than any commercially available, tart, large, perfect blackberries. The small squishy shining black gems found in the wild are packed full of flavour, sweet and waiting to burst into a smear of purple black juice. The hedges near our house had a reasonable harvest, but not enough for any extravagantly filled pie, tart or jam…. so it was time for thinking caps on! My lovely brother gave me some rather wonderful handmade chocolate from ‘Melt’ which was flavoured with blackberry and cinnamon. I was rather taken with the berry / chocolate combination, but found the cinnamon not to my taste. These are rolled in a mixture of icing sugar and purple edible sugar (not that you can notice the glitter!) as I’d run out of my first choice of cocoa powder. In the end I think they look rather pretty with the contrasting coating. 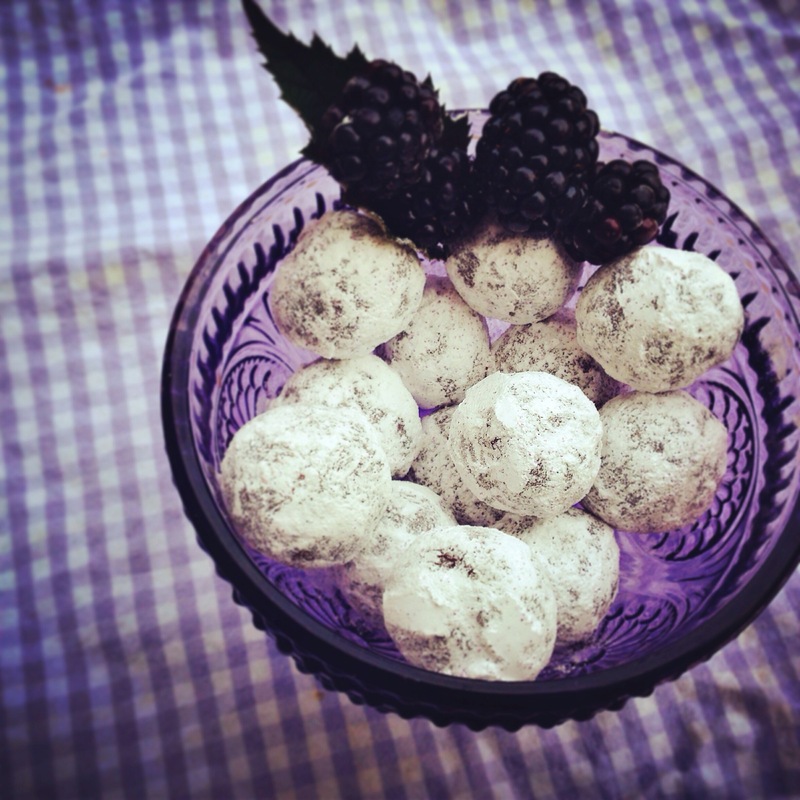 Feel free to roll the truffle balls in anything you like, or nothing at all. 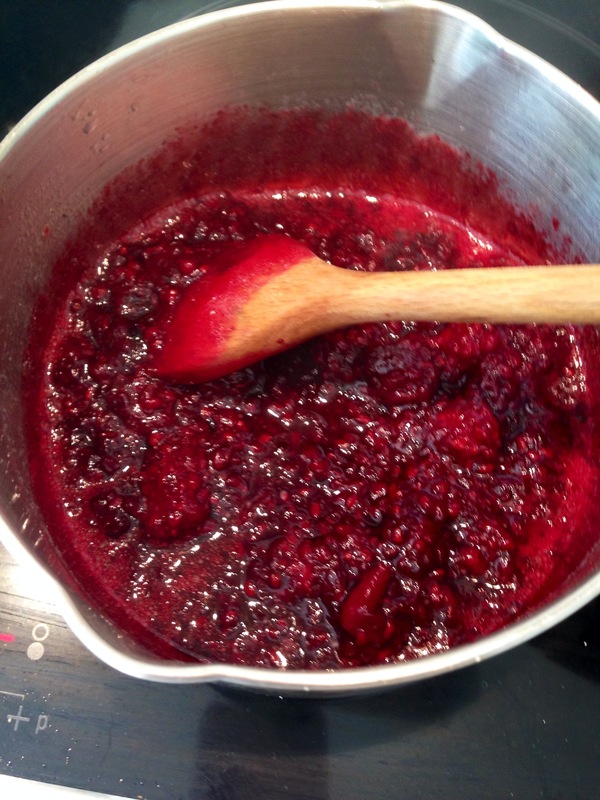 – Stir in the reduce blackberry syrup and leave in a cool place to harden. It has to be firm enough to roll into balls, but not so firm that it has reformed into a solid lump! These are utterly gorgeous, I haven’t been able to get round to foraging for them so far, but if I do I would love to try and make these. Made them yesterday, but they would not harden enough for coating in powdered sugar. But I was able to roll them in balls and stacked them into the freezer. Now I coated them with couverture chocolate. They are heaven! thanks for sharing. I like your recipes and your style of writing. I am German, so maybe I use some weird words – sorry for that. But I wanted you to know!